When Hortaleza Professional's Light Havana on my hair finally came to a flatline, I immediately planned to have my hair recoloured in Revlon Colorsilk's Light Ash Brown 50. However, my colorist recommended Dark Soft Brown 33 to avoid any improper hair gradation due to some presence of the previous color proximal to the hair tips. Imagine my relief seeing how my hair colour toned down from screaming red to --- well, good old brown. I nearly made a disastrous choice in opting for Light Ash Brown. 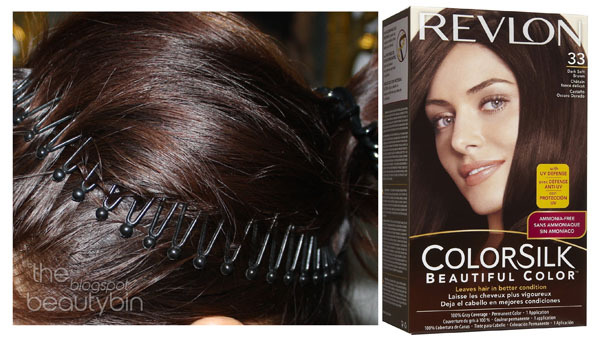 Revlon colorists sure know great stuff for the hair. If you think you made a bad choice with a very vibrant hair color like Light Havana (well, my blogger friends from the Goody event thought otherwise), you can go for the Revlon Colorsilk Dark Soft Brown 33 to tone things down a bit. Sure worked for me. It's difficult to remove redness. Galing ni colorsilk. I used lumina before. ok din. I'm happy the redness got away. Well, when the dye died down, my hair was weird rusty ---- colorsilk saved the day! Yes, luminista's real good. I've seen it on other people and it really makes the hair shiny. Love the new hair color. Your hair looks so healthy!